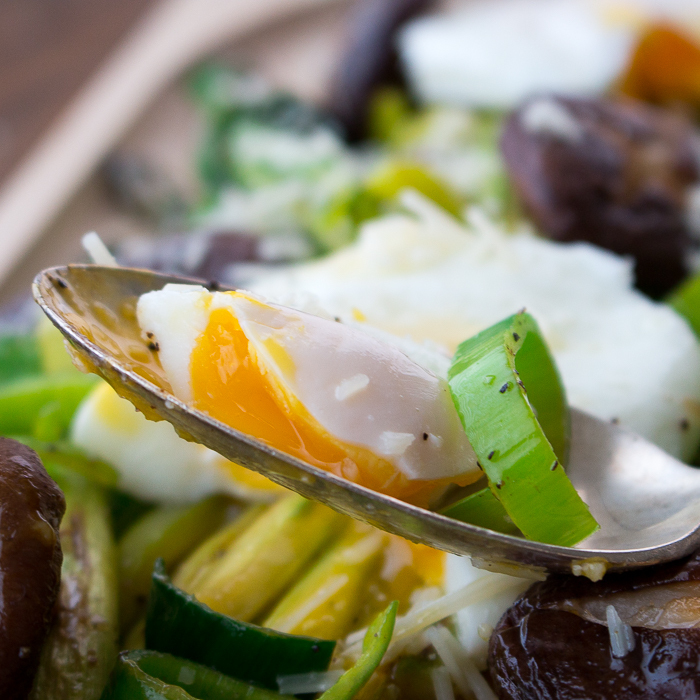 You are just going to love Sautéed Asparagus and Mushrooms with Poached Eggs recipe as it is so creamy with the drippy egg, garlicky, savory and cheesy with a fresh grating of Parmesan cheese. 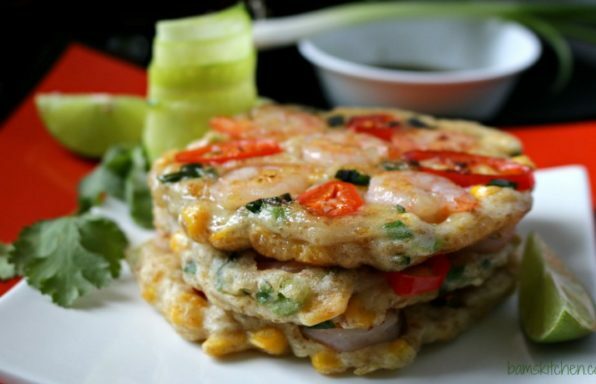 If you are looking for a keto/ low carb friendly, diabetic friendly, vegetarian and gluten-free meal, you are in luck. This delicious meal checks all these boxes too. You know those crazy nights that you are on your way home from work and have the stunning realization that you never took anything out of the freezer to prepare for dinner?! Uggh! Maybe you have an empty refrigerator. Maybe you are supposed to be in three different directions in 3 different townships at the same time and have only a few minutes to whip up dinner or a meal. 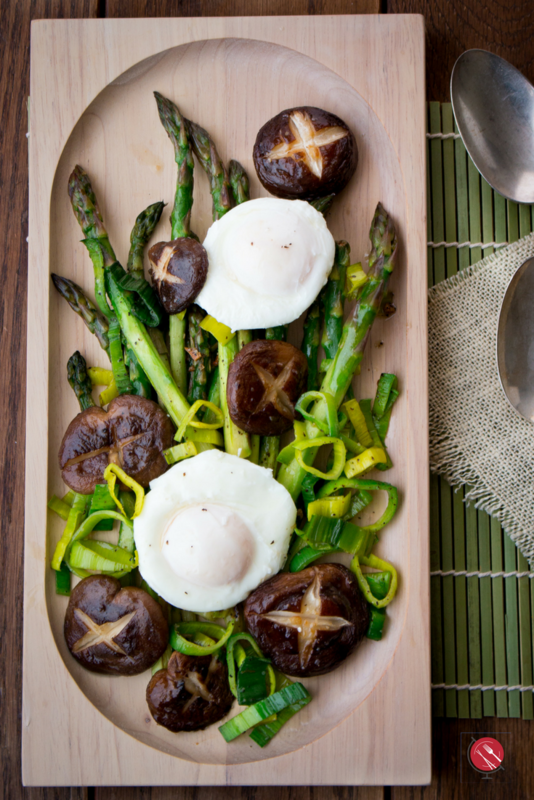 Sautéed Asparagus and Mushrooms with Poached Eggs is a perfect meal any time of the day. Breakfast, brunch, lunch, dinner or anything in between. 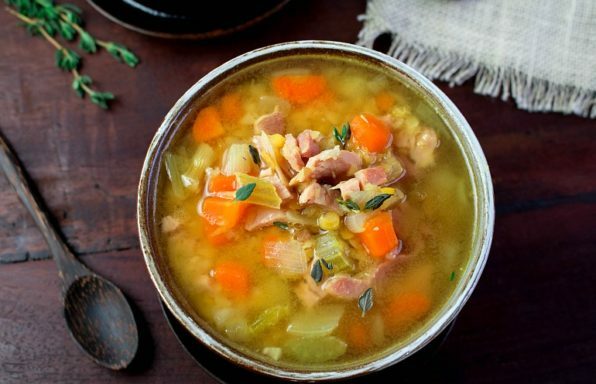 It can be whipped together in less than 15 minutes. No thawing, no fussing, no fancy ingredients. Even picky eaters that have never eaten a poached egg before will be licking their plates clean. Have you ever poached and egg before? It is super easy to do. Bring a saucepan of water up to a slight boil/simmer 160 to 180 degrees F. (71 to 82 degrees C.) The best technique is to bring your water to a boil and then bring back down to a simmer. You want to use a pan/pot that is at least 4 inches deep and we also prefer a pot with a non-stick bottom so the egg does not stick to the bottom of the pan. If you are poaching 4 eggs then you need to choose a deeper frying pan/dutch oven so that you can get all the eggs together without touching. Or you can poach them all separately, one at a time. If you are new to poaching, doing one egg at a time until you get the hang of it is optimal. Add vinegar to the water. 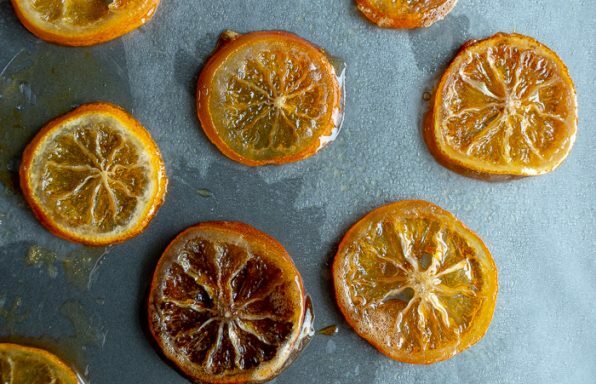 Vinegar has its pros and its cons. Eggs are made up of mostly protein and when the egg whites hit the hot water they tend to disperse in the water. If you add vinegar to the water, it helps the egg whites firm up faster so that your inner egg yolk has a chance to cook. However, vinegar, in some cases can make your poached egg have a firmer outside texture. So maybe try one both ways and do the way you are most comfortable with. Break your egg into a small dish, carefully to avoid breaking the egg. This step just makes it easier to place the egg into the pan gently and if you get any shell in there it is easier to get out. Next stir your light boil/simmering water in a clockwise direction to make a whirl pool. This helps the egg whites wrap around each other to obtain that classic poached egg shape. Next, carefully, slide your egg white and whole egg into the prepared pan. Set your timer for 3 minutes. 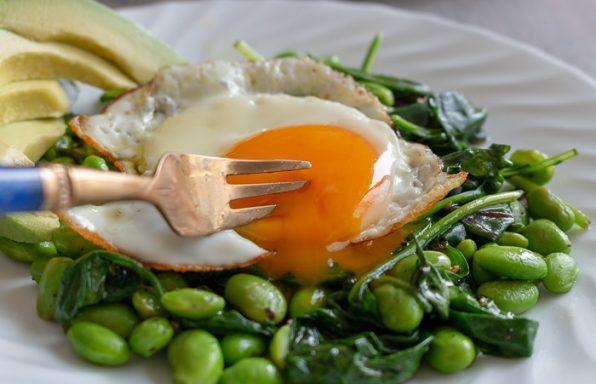 Ladle out your egg and if desired trim any unwanted edges on your egg and enjoy. The perfect drippy poached egg. You have 3 minutes, right? 3 little minutes that take this ordinary dish to extraordinary. You see that drippy part of the egg makes the special decadent sauce to enjoy over the sautéed asparagus and mushrooms. 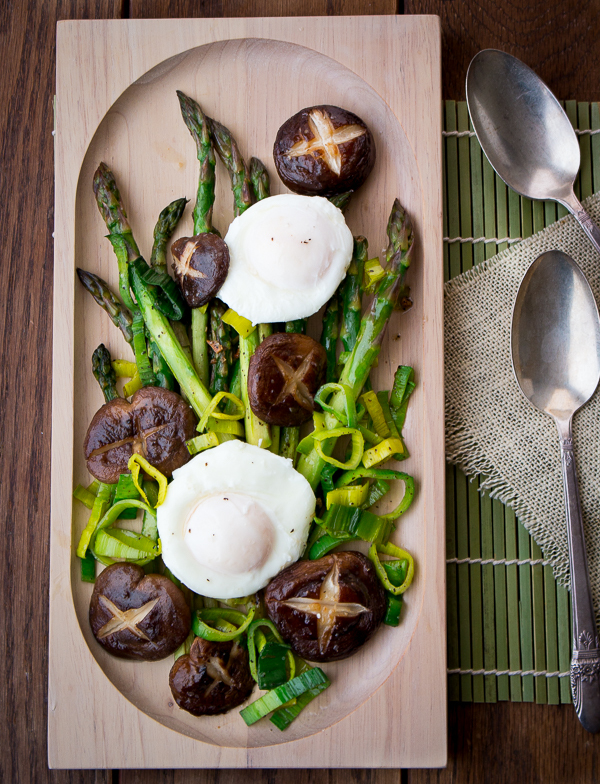 Sautéed Asparagus and Mushrooms with Poached Eggs is fabulous plain. However, if you want to take it to the next level, sprinkle with a little freshly grated parmesan cheese before serving. Simply sublime! Have you seen our last recipe, Stove Top Parmesan Leek Frittata? We have been on a little bit of an egg and leek kick. 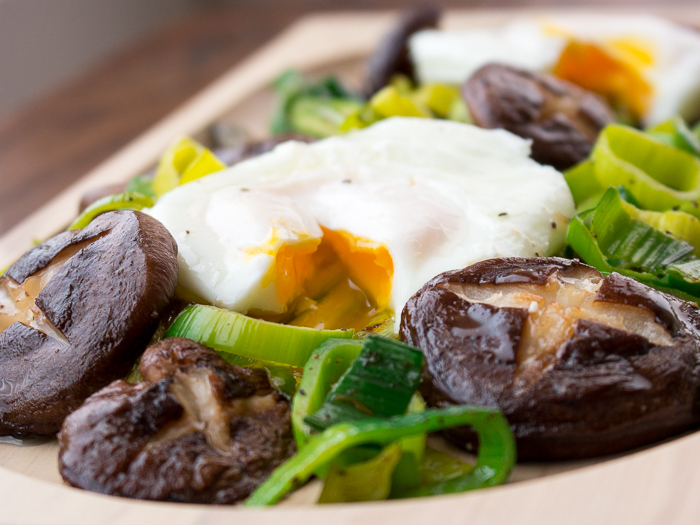 Leeks are in season now so celebrating their divine sweetness in texture adds another dimension to Sautéed Asparagus and Mushrooms with Poached Eggs. Quickly sautéing your leeks with your asparagus and mushrooms brings this whole dish together. Feel free to exchange a little chopped shallot or sweet yellow onion if you do not have leeks. 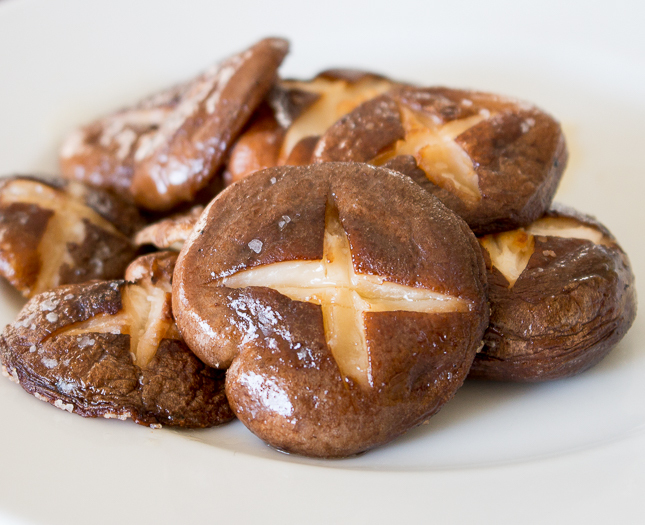 We used shiitake mushrooms only because they were on sale at the market. 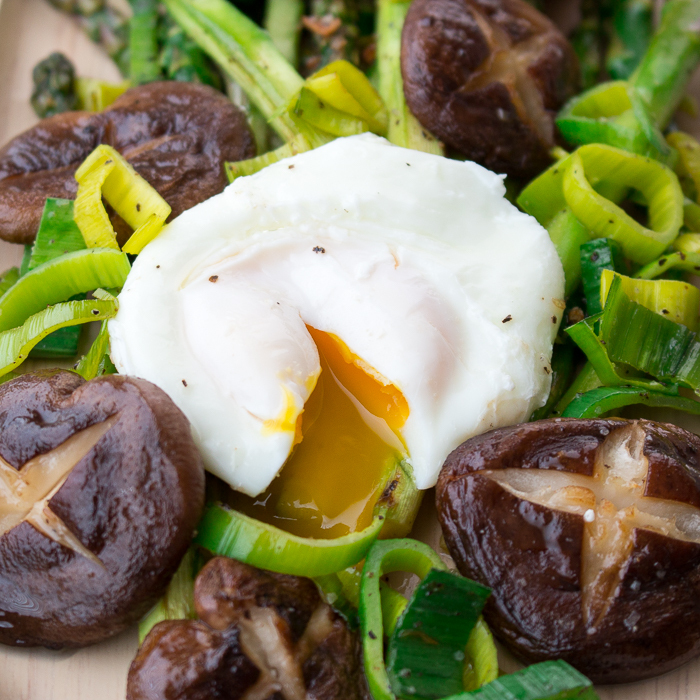 Sautéed Asparagus and Mushrooms with Poached Eggs is also delicious with button mushroom, baby portabella, or even enoki mushrooms. Use whatever you have on hand. 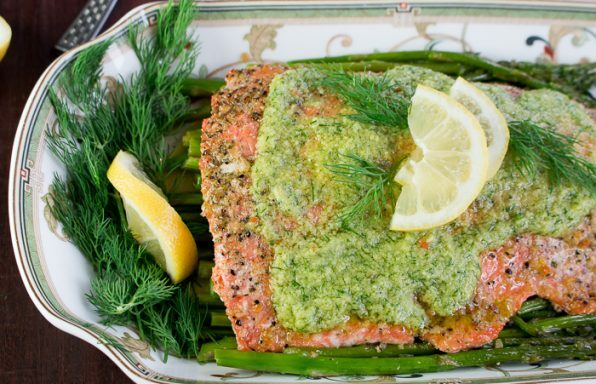 Asparagus are in season and readily available in the markets near us. We chose to peel the bottoms of the asparagus to make them extra tender and create a more finished dish. However, this is not required. The most important part is to make sure that you either break or cut the asparagus where the tough and the tender parts meet. 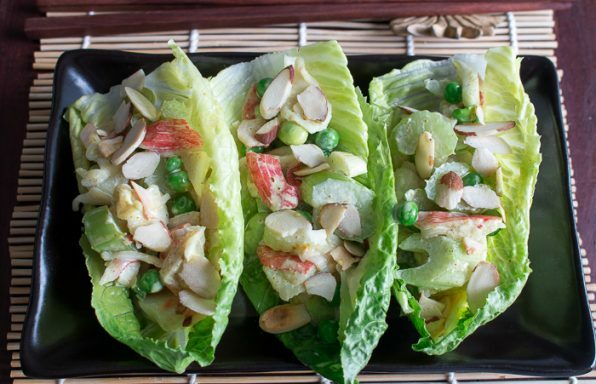 If you looking for more low carb recipes, be sure to check out these ideas. 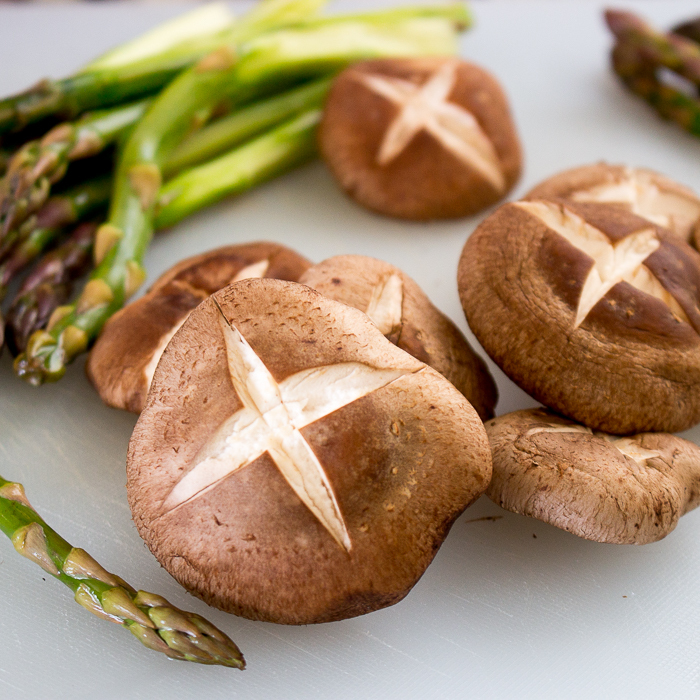 Mushrooms – 8 ounces wiped clean and tip of stem trimmed off (We used shiitake mushrooms) Feel free to substitute with your mushrooms of choice and if large be sure to cut into quarters or slice to allow for even cooking. Water – enough to make your sauce pan ¾ filled. 1In a frying pan, add your olive oil and mushrooms and sauté until fragrant. Add your asparagus to the pan and sauté and gently tossing over medium heat until almost fork tender. Then add your sliced leeks to the pan. Salt and pepper to taste and sauté until all vegetables and mushrooms are tender and vibrant green. Set aside. 2In the meantime, bring a saucepan of water up to a slight boil/simmer 160 to 180 degrees F. (71 to 82 degrees C.) The best technique is to bring your water to a boil and then bring back down to a simmer. You want to use a pan/pot that is at least 4 inches deep and we also prefer a pot with a non-stick bottom so the egg does not stick to the bottom of the pan. If you are poaching 4 eggs then you need to choose a deeper frying pan/Dutch oven so that you can get all the eggs together without touching. Or you can poach them all separately, one at a time. If you are new to poaching, doing one egg at a time until you get the hang of it is optimal. 3 Add vinegar to the water. Vinegar has its pros and its cons. Eggs are made up of mostly protein and when the egg whites hit the hot water they tend to disperse in the water. If you add vinegar to the water, it helps the egg whites firm up faster so that your inner egg yolk has a chance to cook. However, vinegar, in some cases can make your poached egg have a firmer outside texture. So maybe try one both ways and do the way you are most comfortable with. 4Break your egg into a small dish, carefully to avoid breaking the egg. This step just makes it easier to place the egg into the pan gently and if you get any shell in there it is easier to get out. Next stir your light boil/simmering water in a clockwise direction to make a whirl pool. This helps the egg whites wrap around each other to obtain that classic poached egg shape. Next, carefully, slide your egg white and whole egg into the prepared pan. Set your timer for 3 minutes. Ladle out your egg and if desired trim any unwanted edges on your egg. Season your eggs with salt and pepper as desired. 5Place your sautéed asparagus, mushroom and leek mixture out onto a serving plate. Top with your poached eggs and sprinkle with a little freshly grated parmesan cheese if desired. Break open the delicious drippy egg and swirl around your delicious vegetables in the dreamy sauce and enjoy.